Are You Working On Improving Your Credit Score? I Am! This is a sponsored campaign in collaboration with Chase and Mom It Forward Influencer Network. Thanks to them I can talk to you about the importance of checking your credit score and staying on top of your credit. As someone who struggled with bad credit for so long, I think this is such an important topic. I didn't always have good credit. I got married young and I'd be lying if I said I even knew what my credit score was back in the 90's. Not that I didn't see good credit in action, my mom was always super responsible with her bills (as most Latinos tend to be). She had a bank account and a few credit lines that she paid religiously, plus she never spent more than she made. My mom had good credit, but I don't think she ever talked to us about money matters. When I went my own way, I was completely clueless. Fast forward 7-8 years, my credit was probably average at that point but again I had no idea how to even check it. So when my divorce came around and I was left with hundreds of dollars in utility bills unpaid, that were all under my social security number, I didn't realize how big an impact that would make on my life. Living with bad credit is hard when you want to achieve bigger things in life. While my credit was good enough for me to get by with my kids, I always knew I would never be able to purchase a home or start a business. It's really hard to know that there are limits to what you can do based on your credit, even if you earn a good living. If your credit score is low, you have to be prepared to pay cash for everything or pay a really high interest rate. It took me about 36 years of life to figure out how to take care of my credit. That's a long time isn't it? But being so clueless about my credit for so long taught me that I had to prepare my kids to have a different experience. I now track my credit score every two weeks and strategize ways to raise it. While I am still at good credit and not quite at excellent, I do plan to get there very soon. 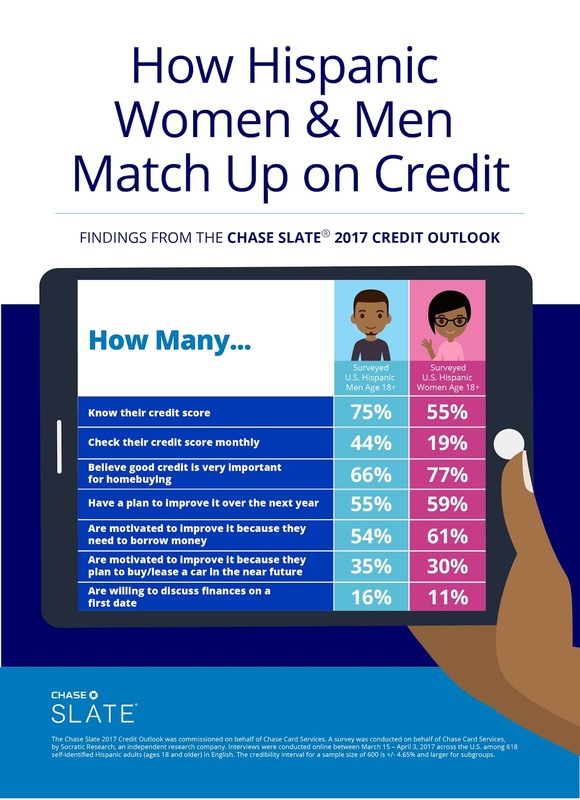 According to the Chase Slate 2017 Outlook Survey, less than half of Hispanics (47%) are very satisfied with their credit score compared to 55% of Americans nationally who have checked their credit score, but 72% of Hispanics would like to improve their credit score and more than half (57%) have a plan to do so. They are more likely to be motivated to check their credit score out of specific financial concerns rather than because the information is provided as a free service. 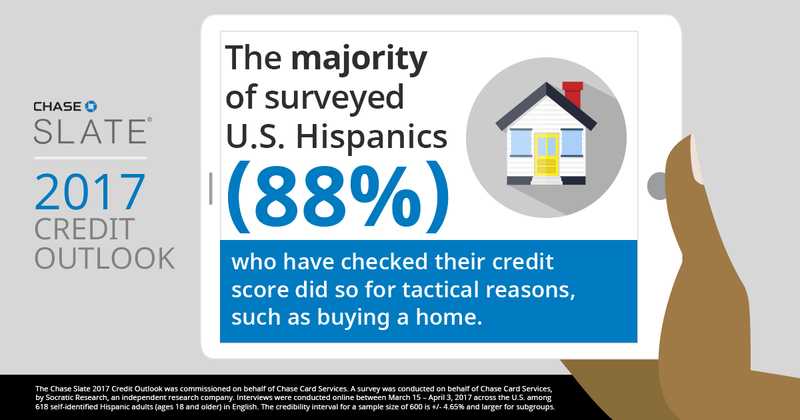 Hispanics are checking their credit score for tactical reasons. Hispanic Millennials are the most motivated to improve their credit scores. Putting credit improvement plans into action. Hispanic parents want their children to learn about credit. Things like buying a car, a home, starting a business or sending kids to college are major reasons for having good credit. Hispanic parents aren't just being more vigilant about their own credit, they are teaching their kids about money management and raising a generation of Millenials that will have great credit. My older girls all know exactly what their credit score is and are actively working on improving and keeping their scores high. They are also saving money and budgeting their expenses every month. It feels good to know that they won't go through what I did when my score was so low. There really are many ways to strategize and plan your way to a better credit score. Get more information about checking your credit score and maintaining good credit by visiting the Chase Slate website. Stay informed by following Chase Slate on Facebook, Twitter and Instagram.